The Unlimited class is known for tough competition, big personalities, and crazy action. 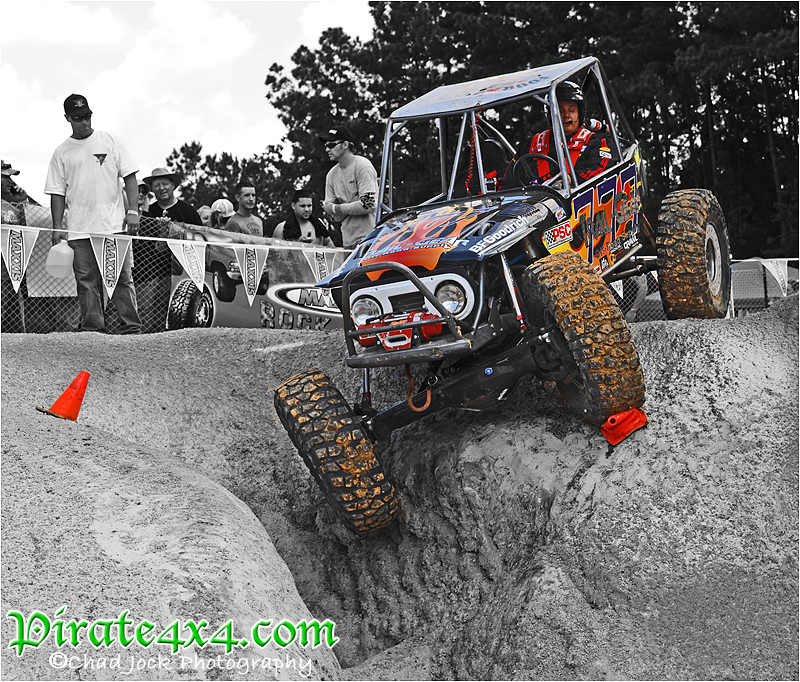 A total of 21 teams from the US (19 teams) and Mexico (2 Teams, Hernandez and Pereda) made their way to the Spring Creek Off-Road Park for the 3rd annual W.E.Rock Grand Nationals. Courses varied from running through a tough valley on A1 to going through a gnarly bowl on A2. 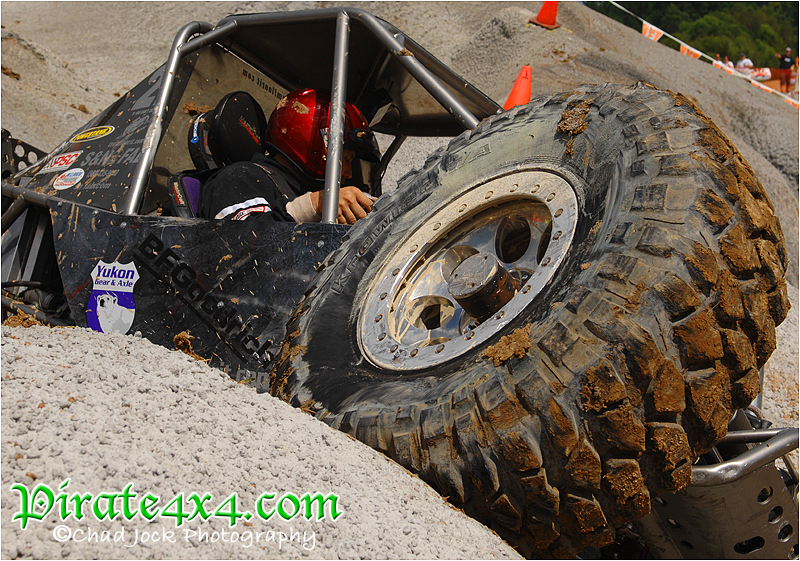 There was mud that would make Jellico proud, and high traction hill sections for A4. Shannon Campbell seemed to be on rails Saturday. His rig seemed to hook up all day long, and he made everything look easy. 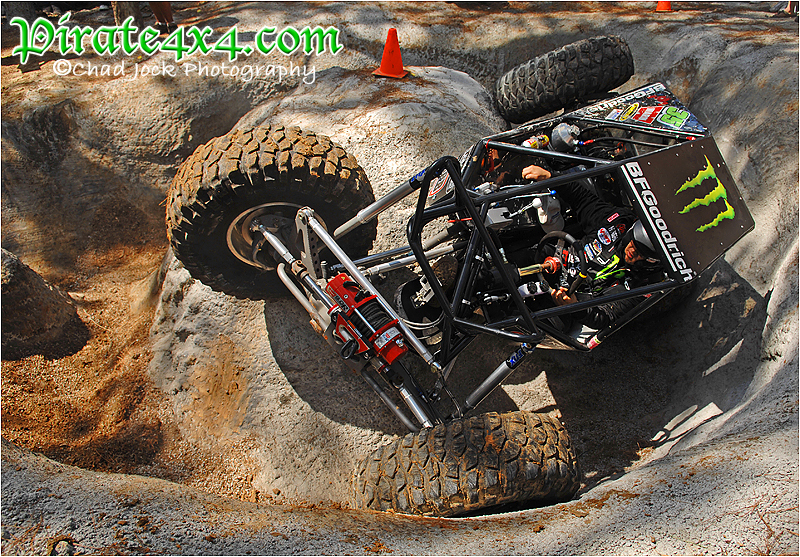 It didn't matter what was thrown at him today, Campbell's Monster Energy Drink Moon buggy was the class of the field. Shannon would finish the day with a 12 point lead over Jesse Haines. Shannon may have been the class of the field, but the excitement was with the teams who were chasing him. 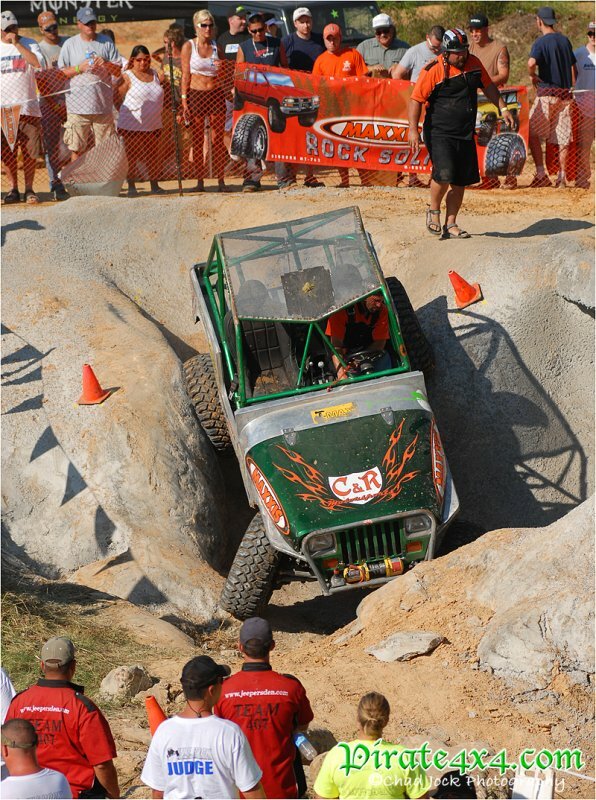 The teams of Jesse Haines and Cody Waggoner approached the four obstacles in their own zones with each team carefully calculating their moves for the day. Both drivers were waiting for Shannon to make a mistake, so they could capitalize on the opportunity. Matt Deas drove well all weekend. The 2007 Eastern National Champion was in 4th place, but there was a relatively new face right there with him. Mark Ruffing may be a new name, but his skill behind the wheel has obvious. For three obstacles, Ruffing had been on pace with the top teams, but a big mistake on A2 would cost him and he would fall to 5th for the day. Brad Styles came to Houston without familiar spotter Stacey Walker, but hope was not lost. Styles would turn to a legend to lead him through the obstacles for this event. Ken Shupe would take over for Walker. Shupe would help lead Brad to 6th for the day, just 1 point out of 4th. You can never count Bruce Zeller or Jason Paule out of the game. At the start of the competition on Sunday, both Zeller and Paule were on the outside looking in. Both teams put in spectacular runs on all four obstacles to find themselves capitalizing on the mistakes that Cody Waggoner and Mark Ruffing made. Waggoner started the second day of competition in 3rd, but would struggle on three obstacles. Waggoner would finish a disappointing 9th. One team that fought their way to a run at the shootout was the team of Alan Woodson. The driver from the East is known for his quiet style and consistent runs. At the end of the first day, Woodson, was sitting in 12th, but knew he could be a challenger for a shootout position. Woodson drove his own race out there, but just came up a few points short of his goal and would take home a well earned 7th position. In the shootout, Jason Paule would make a huge mistake near the finish that would put him on his lid. Jason took 36 points in the shootout, and would finish 6th. Like Paule, Bruce Zeller would also make a mistake at the end of the shootout and end up on his lid. Bruce would finish 5th in what appears to be his final event. We will are sad to see him go. Brad Styles and spotter Ken Shupe worked well in their first outing together. The Southern Styles team put in consistent runs all weekend, and in the end they would be the first to conquer the shootout with a score of 11 points. Their strong performances on this weekend would be rewarded with a 4th place finish. Matt Deas and Mike White drove smart all weekend. Seeing what lines worked for Styles and Shupe, Matt and Mike attacked the courses for all they were worth. In the end they would finish the shootout with a score of 0, which would put them 3rd for the weekend. All eyes were now focused on the team of Jesse Haines and Brian Howard. In the 2005 running of the GNC at Columbus, Randy Torbett dominated, but a quiet kid from Indiana was right behind him. In the shootout of that event, Torbett would falter, and Jesse Haines would become the first Grand National Champion. Two years later, Jesse Haines found himself in the same position as he did in Columbus. He was in chase mode, and was locked in and gunning for Shannon Campbell. Jesse and Brian finished the course with just 2 points, but he would be 28 points off of Shannon Campbell. The question was, could Shannon hold on for his first GNC title? Shannon and spotter Lance Clifford had been the class of the field all weekend and were determined not to fall out of the championship now. However pressure has a funny way of creeping up on people, and little mistakes add up quickly. Shannon would cross the finish line with 57 seconds left and 2 points behind Jesse Haines. This Grand National Champion was going to come down to the final seconds. Shannon had just enough time for one bonus attempt. If was run perfect he would claim the 2007 championship. If not Jesse Haines would pull off a huge upset. Shannon and Lance were off on their bonus run. They made the climb look perfect. They dropped off the top of the obstacle, and made their final descent. Seconds were ticking off the clock, and when Shannon crossed the line there was only 3 seconds left. 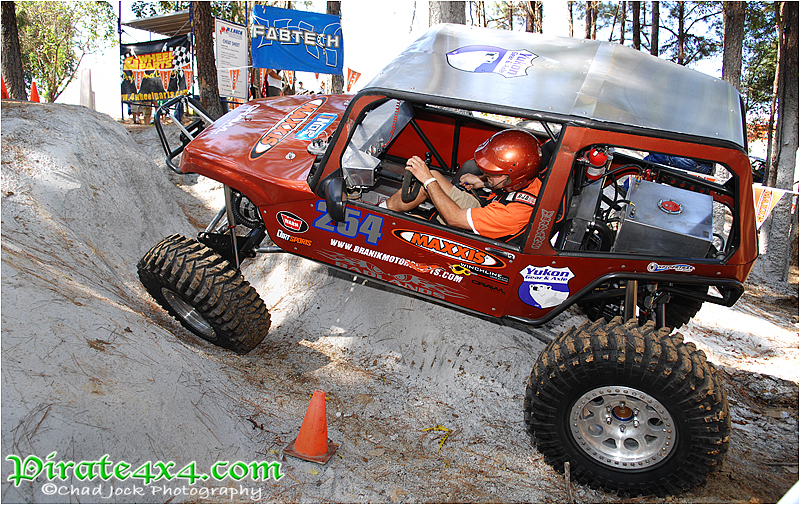 Shannon Campbell was the 2007 W.E.Rock Grand National Champion by 3 points, and 3 seconds. The quiet man from South Dakota has a thing for events in Texas. One year ago, Errea decimated the competition in Boyd, TX. 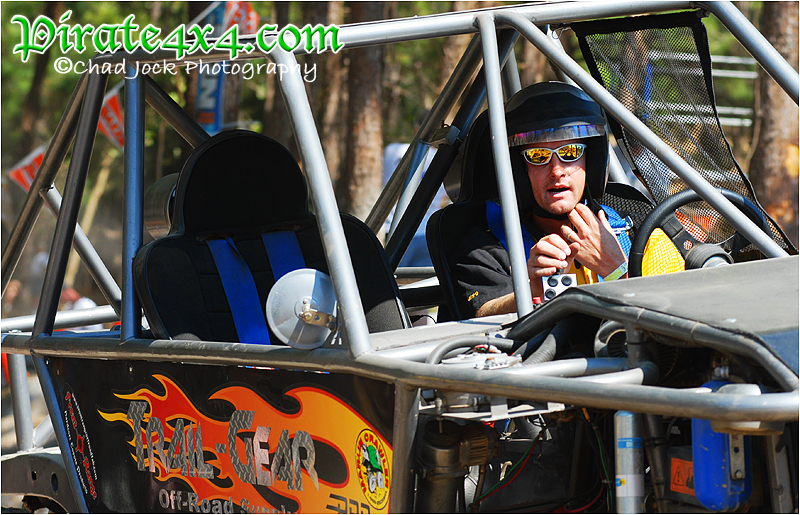 The Rock Runner Racing team driver found himself at the helm again for the Grand Nationals. Brian had a strong start, but began to falter on the second day of competition. Small mistakes lead to other small mistakes, and that does not lead to wins. A big run on A4 would put Brian back at the top of the standings going into the shootout. From there Brian was home free. The 2006 GNC champ would hold on to win his second straight GNC title by 10 points. Terry Dagan and Rusty Bray were locked into a battle for the runner up position for the entire event. Dagan and Bray found themselves in an almost dead heat coming into the shootout. Rusty would lead Terry going into the shootout, but a couple of minor mistakes during the shootout would knock Rusty from 2nd to 3rd in the standings. Todd McCullen finished his rig just days ago. You wouldn't have guessed that however, as McCullen, put in a stellar event and brought home a respectable 4th for the weekend. Tim Florian and Ken Blume would survive the rough conditions on the second day to bring home 5th and 6th. With many top teams in the very large Pro Modified field, many favorites would not make the shootout. Dean Bulloch made a run for the shootout, but would come up short and would take 7th. Mike Cole was 19th after day one, but some top notch performances in the second half would move Mike to 8th overall. Brad Lovell was strong at the start of the event, but many mistakes would drop the Western National Champion down to a disappointing 11th. Becca Webster, Dave Cole, Drew Goldie, Danny Roher would all falter in Texas and would all finish near the bottom of the score sheets. However this did not stop them from all putting of great shows for the fans during the event. "To finish first you must first finish." It's an old racing proverb. This would prove true for Derek West. The 3-time undefeated Eastern National Series Champion put in the drive of his career. West managed to finish every obstacle in a very clean fashion. Either setting the low score, or not being that far off the mark. Derek would dominate the class, and would leave all the teams fighting for the other positions. To say that Derek West was the class of the field is an understatement. He threw a no hitter at this event. Troy Bailey, like Derek West, took the Western National Series championship in an undefeated fashion. Bailey's ability to finish all of the obstacles placed him solidly in 2nd place. Like West, Troy Bailey managed to put in consistent performances and played 2nd fiddle to Derek West all weekend. Ricky Artes was the surprise of the Grand Nationals. Like West, Artes delivered the drive of his young career. The Florida native put in solid drives to keep up with the reigning world and national champions for most of the weekend. A mistake during the shootout would put Artes on his lid. He would fall from 3rd to 5th. Dan Patterson and Buzz Bronsema, were solid on the second day of competition, after faltering during the first day. Patterson and Roggy would recover to finish 3rd, and Buzz Bronsema would finish 4th after engine problems. Rookie Kurt Shramovich would make the shootout, and would finish in 6th. From the start of the Formula Toyota event two things were certain. The three west coast guys were going to deliver a show, and a race was on. It was a three way race off the start on C1. Hobie and Matt Messer were tied with John James right behind them. Hobie would jump out to a clear 12 point lead over, Messer on C2. However it was C3 that would throw, James into the lead. He would continue to hold on to the lead through half time. On the second day, John James was in points mode. Hobie was wanting to apply pressure. Matt Messer wanted to make up spots, and John Schneihauer just wanted to finish. In the end Hobie and John were in a tie, and Matt Messer made a very good run at the win, but came up short. It all came down to the tie breaker, and by 1 point on C1, Hobie Smith was declared the Grand National Champion.